It's not just Speed Dating in New York anymore! Our New York singles events take place at Bryant Park Lounge in Manhattan and at other New York Speed dating venues. Our New Yorkdating events have resulted in over 65 married couples so far. Use the box below to search for New York SINGLES EVENTS Only. If you are new to singles events, check out our guidelines for choosing the right New York singles event. Thanks to your many suggestions and feedback received over the past 4 years, it is not just speed dating New York anymore. Many of the events modify the speed dating format to an activity. 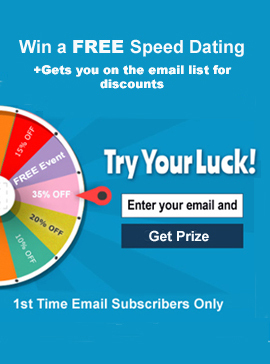 These New York Speed Dating and singles events are structured so that you get to enjoy the activity, but are also ensured to meet everyone who attends by incorporating a rotation factor. This eliminates any awkward entrance to exists to conversations. Have questions or Concerns? Call Jay at 718-757-6933 or 516-908-9638. We held our first New York speed dating event for New York singles on Valentines Day 2003 and have since expanded to New York and Connecticut Over 65 married couples and we are still going strong!